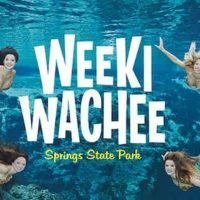 The mermaids of Weeki Wachee Springs State Park have delighted visitors since 1947, witness the magic of the mermaids, take a river boat cruise and canoe or kayak on the Weeki Wachee River. Buccaneer Bay offers a fun-filled adventure for thrill seekers of all ages. Our white sandy beach area and covered picnic pavilions provide a relaxing day for your entire family. Weeki Wachee’s animal shows provide audiences with an entertaining and educational look at domesticated birds and reptiles.